This recipe is one that kids just love. My only advice is to make sure the chicken has cooled a bit before you serve it, because the sugar makes the glaze very hot. 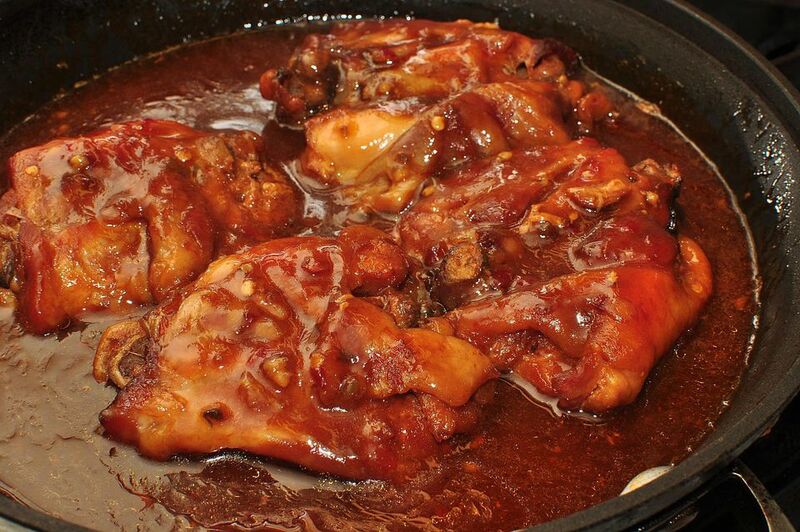 You can make this recipe for Sticky Chicken with boneless, skinless chicken thighs instead. Just increase the cooking time by 10-15 minutes. And be sure to watch the chicken carefully in the sauce. Because there's so much sugar in it, it can burn easily. You can reduce the sugar in this recipe a bit if you'd like, but not too much, since it is crucial to the texture of the sauce and the flavor. I would only take out a few tablespoons of the sugar. Don't use a sugar substitute in this recipe because it will not work and the sauce will become bitter. Serve this recipe with lots of napkins or wet wipes, some rice pilaf or cooked pasta mixed with butter and Parmesan cheese, and a green salad or steamed carrots or green beans. An ice cream pie or brownies for dessert would be wonderful. Combine all of the ingredients except the chicken in a shallow baking dish and stir until the sugars dissolve. Add the chicken and turn to coat well. Cover the dish tightly with foil and chill in the refrigerator for at least 24 hours. When you are ready to eat, transfer the chicken and the marinade to a large heavy nonstick skillet. Reduce the heat to low, cover the skillet, and simmer for 8 to 13 minutes, moving each piece around with tongs occasionally. Check the breasts for doneness (160 degrees F on an instant read thermometer) and remove to a shallow pan as soon as they test done. Cover the cooked chicken and place in a warm oven to keep warm. Increase the heat to medium when the chicken is all cooked and removed from the pan, and cook the marinade remaining in the skillet until syrupy, stirring occasionally at first, then stirring constantly as the mixture starts to thicken. This should take about 4 to 7 minutes total. Return the chicken to the skillet, coat it with the sauce, and serve sticky chicken immediately - with lots of hot cooked rice and napkins!